“Jerusalem’s political standing has long been, and remains, one of the most sensitive issues in American foreign policy, and indeed it is one of the most delicate issues in current international affairs.” In his opinion in Zivotofsky v. Kerry, Justice Kennedy delicately handled the complexities of the United States’ relationship with Jerusalem when faced with the question of whether Congress may recognize Jerusalem as Israel’s capital, while the president asserts that no state has sovereignty over Jerusalem. In this case, the Supreme Court held that the power to recognize a foreign government lies squarely with the president. A mere two years after the holding in Zivotofsky, President Trump formally broke with decades of U.S. policy on December 6, 2017, announcing that he “determined that it is time to officially recognize Jerusalem as the capital of Israel.”  On May 14, 2018, the United States opened its new embassy in Jerusalem. This decision sparked international tumult. Palestinian President Mahmoud Abbas said that the decision was tantamount to the United States “abdicating its role as a peace mediator,” while Israeli Prime Minister Benjamin Netanyahu called it “courageous and just.” Leaders of the Muslim world generally viewed the decision as a dangerous one that would have repercussions, while Pope Francis and European leaders expressed concerns over heightened tensions and the diminished prospects of a peace deal. Following the December 2017 decision, the United Nations General Assembly proposed a resolution to determine Jerusalem’s status, calling on other nations to refrain from locating their diplomatic mission in Jerusalem. Nine countries voted “no,” including the U.S., Israel, Guatemala, Honduras, Marshall Islands, Micronesia, Nauru, Palau, and Togo. Thirty-five countries abstained, and 128 voted “yes.” The international community’s overwhelming condemnation was not, however, the end of the U.S.’s diplomatic challenges. According to Palestine, in view of the special status of Jerusalem, “[t]he relocation of the United States Embassy in Israel to . . . Jerusalem constitutes a breach of the Vienna Convention.” The contention is based on the premise that because the Vienna Convention requires the embassy or diplomatic representation to physically sit on the territory of the receiving state, and because Jerusalem is not internationally recognized as Israeli territory, the embassy in Jerusalem is not valid. As basis for the Court’s jurisdiction, the “Applicant” – the entity initiating the proceedings – invokes Article 1 of the Optional Protocol to the Vienna Convention concerning the Compulsory Settlement of Disputes. It notes that Palestine acceded to the Vienna Convention in 2014 and to the Optional Protocol on March 22, 2018, whereas the United States of America had been a party to both these instruments since 1972. The nature of the Vienna Convention, like most treaties, is such that a signatory to the agreement must separately agree, via an Optional Protocol instrument, in order to be subject to the jurisdiction of the ICJ. In other words, a party may be a member to the agreement itself but decline to settle disputes arising under that agreement in the ICJ if it chooses not to accede to the Optional Protocol. This situation, of course, creates a somewhat illogical result, making the enforcement of the agreement impossible. Illustrative of this systematic weakness is the U.S.’s decision, immediately following Palestine’s instituting proceedings, to withdraw from the Optional Protocol, which otherwise would have compelled the U.S. to settle the Palestinian dispute in the ICJ. Though the ICJ considers its resolutions to be binding upon the member states, the reality is that there is no recourse or enforcement mechanism when it issues a judgment. In Nicaragua v. United States, the ICJ found, inter alia, that the United States’ involvement in the contra affair was a violation of international military and paramilitary law. The Court found that the U.S. had an obligation to pay reparations to Nicaragua, to which the U.S. responded by rejecting the Court’s jurisdiction over the matter and refusing to pay. The U.S.’s general dissociation from the ICJ, compounded with its historical rejection of Palestine’s statehood, cast serious doubts on the international community’s ability to enforce any judgment resulting from these recent proceedings. The question remains then, who can? As the United States swings back toward pre-WWI-era nationalism, its posture within international institutions will continue to be in question. Zivotofsky v. Kerry, 135 S. Ct. 2076, 2081 (2015). Statement by President Trump on Jerusalem, The White House (Dec. 6, 2017, 1:07 PM ET), https://www.whitehouse.gov/briefings-statements/statement-president-trump-jerusalem. 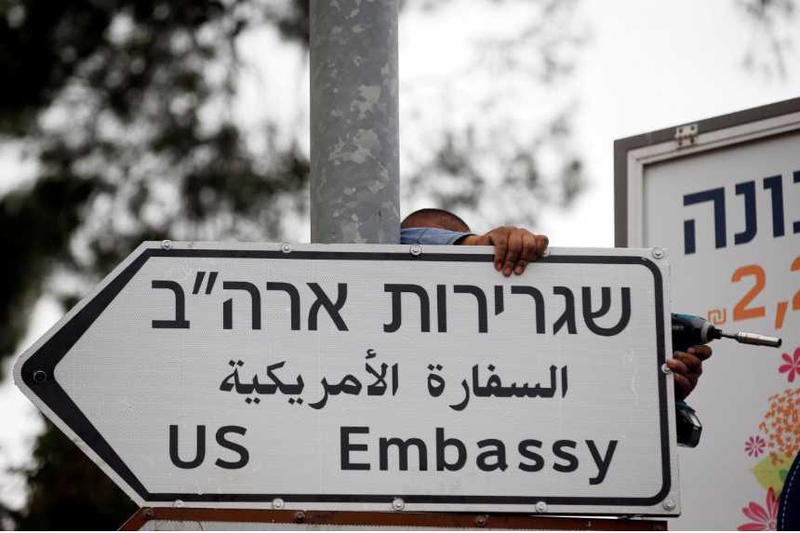 Stephen Farrell, Why is the U.S. Moving its Embassy to Jerusalem?, Reuters (May 7, 2018, 6:48 AM), https://www.reuters.com/article/us-usa-israel-diplomacy-jerusalem-explai/why-is-the-us-moving-its-embassy-to-jerusalem-idUSKBN1I811N. British Broadcasting Company, Jerusalem: Trump move prompts negative world reaction, BBC (Dec. 7, 2017), https://www.bbc.com/news/world-middle-east-42250340. General Assembly demands all States comply with UN resolutions regarding status of Jerusalem, UN News (Dec. 21, 2017), https://news.un.org/en/story/2017/12/640152-general-assembly-demands-all-states-comply-un-resolutions-regarding-status. The State of Palestine institutes proceedings against the United States of America, Int. Ct. of Just. (Sept. 28, 2018), https://www.icj-cij.org/files/case-related/176/176-20180928-PRE-01-00-EN.pdf. Lisa Lambert, U.S. withdrawing from Vienna protocol on dispute resolution – Bolton, Reuters (Oct. 3, 2018 1:31 PM), https://www.reuters.com/article/usa-diplomacy-treaty/u-s-withdrawing-from-vienna-protocol-on-dispute-resolution-bolton-idUSW1N1UJ00V. International Court of Justice, Certain Activities carried out by Nicaragua in the Border Area (Costa Rica v. Nicaragua), https://www.icj-cij.org/en/case/150 (Last visited Nov. 7, 2018). International Court of Justice, Accordance with international law of the unilateral declaration of independence in respect of Kosovo (Request for Advisory Opinion), https://www.icj-cij.org/en/case/141 (Last visited Nov. 7, 2018). Tyler Marshall, World Court Rules U.S. Aid to Contras Is Illegal, L.A. Times (Jun. 28, 1986), http://articles.latimes.com/1986-06-28/news/mn-25504_1_contras/2. Natasha Turak, US rejects International Court of Justice ruling on Iran, continuing its isolationist charge, CNBC (Oct. 5, 2018, 9:38 AM ET), https://www.cnbc.com/2018/10/05/us-rejects-international-court-of-justice-ruling-on-iran-continuing-its-isolationist-charge.html. Military and Paramilitary Activities in and against Nicaragua (Nicaragua v. United States of America), Merits, Judgment, I.C.J. Rep. 1986 (June 27), p. 14. Military and Paramilitary Activities in and against Nicaragua (Nicaragua v. United States of America), Communique No. 88/17, Arch., Aug. 1, 1988. Sara Cook, Trump says he won’t give aid to Palestinians unless they agree to peace deal, CBS News (Sept. 7, 2018, 12:23 AM), https://www.cbsnews.com/news/trump-says-he-wont-give-aid-to-palestinians-unless-they-agree-to-peace-deal/.